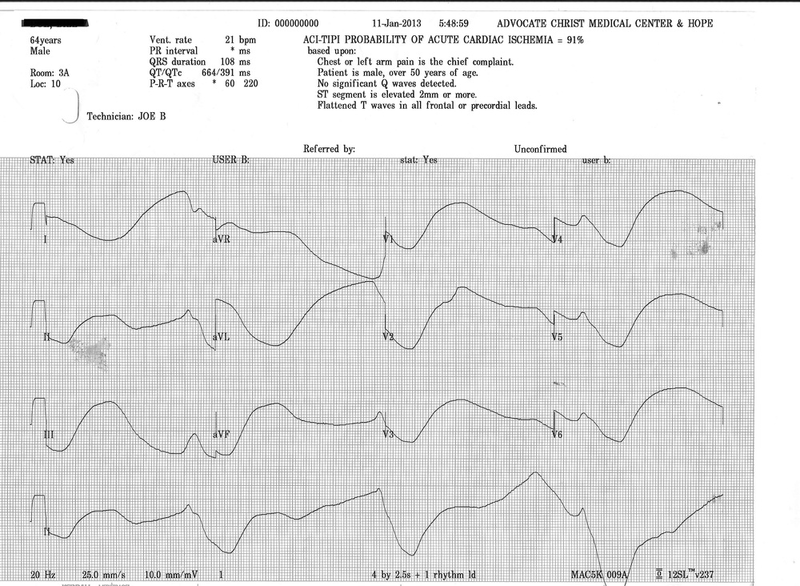 62y/o M presents to the ED with AMS, bradycardia. We cannot get an IV but he looks liek S***. He is short of breath, DEXI is 42, no IV access, Im putting an IO since he is awake but clearly confused. We are trying to still get a full set of vitals and an EKG (since he was a code 44 at 540am). He is defintiely intubatable, but it looks like pulse ox is 100% on NRB, so we have a minute here. I am shooting a quick EKG while pushing an amp of D50 into the IO (which by the way, he didn't complain at all while putting in the IO, but he DID NOT like the D50 getting pushed in). Potassium came back 8.0, acute renal failure, got dialysis a few hours later and despite our best efforts died in the MICCU. Hyperkalemia is scary, but treatable, first and foremost diagnosis in ANYONE with bradycarida without P waves should be hyperK.